“Information wants to be free. Information also wants to be expensive. That tension will not go away ” -Stewart Brand. This is the nature of information and content being posted on internet these days. Media publishers trying to sell videos online have often heard “ Once you have put your videos online, it is free . There can be no DRM on the internet”. How practical is this argument and are there ways to prevent video download on web? I would like to have a take on the notion considering current legislation and technologies. It is true that a content which is online can be acquired by hook or crook. Quality is generally compromised in this forceful acquisition. Camera captured versions of movies in poor quality is a common example. The first infographic is an excellent illustration of means through which paid content reaches the end viewers. It includes both legal methods as well as the path adopted by pirates. It is shocking to see how premium content is able to reach all over the world for free. The circle of warez , torrent and linkers is the primary culprit for this online piracy. As we move away from the center, the number of branches distributing the content for free increases exponentially. 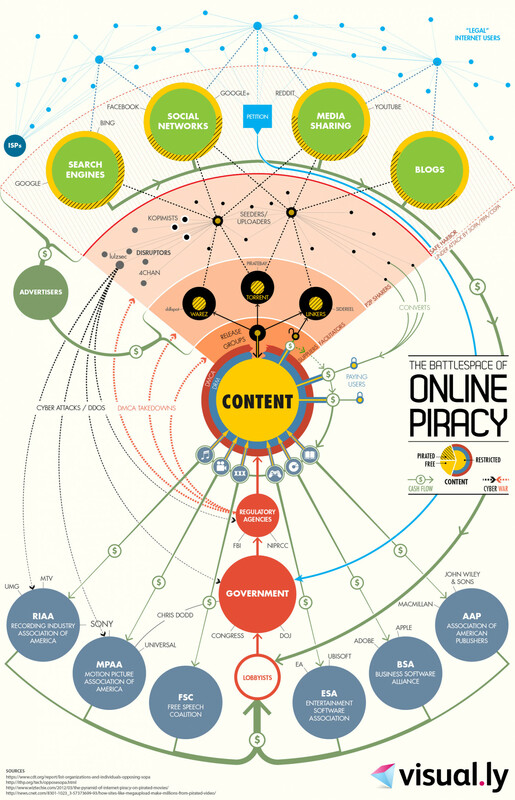 SOPA (Stop Online Piracy Act) has been proposed as a solution to the problem . Instead of trying to prevent stealing of premium content from initial release points, SOPA tries to disarm the websites which have ability to redistribute this release. It targets subsequent circles of seeders , uploaders and downloaders which comprise the general internet users. This circle is the nerve of internet. Trying to restrict it would mean to undo the openness, which the world wide web has brought into the world. Another infographic discusses the numbers relating to online video market and piracy. Lets reflect upon how much a video DRM can affect this scenario. There are encryption & authentication technologies adopted by video hosting companies which are evolving over the time. The videos hosted through these technologies can’t be downloaded on web. Their idea is to make download so difficult that users would find the effort of download to be much exhausting; and ultimately pay for the video. As seen in the first picture , the loss of video content from the release groups and paying users has to be targeted. Lets consider the movie and e-learning industries which are looking to sell videos online. The paid users are the starting point of piracy. One subscriber pays for the video. He downloads it using one of the freely available downloaders. Then, he shares it among his circles or puts it online. This allows everyone to enjoy premium quality content at no costs. Most of the CDNs and online video hosting companies with DRM try to plug these holes. How much effective can DRM strategies be? 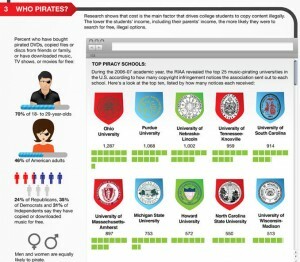 Looking at the second picture, one can see that in USA 70% of the pirates are of age 18-29. 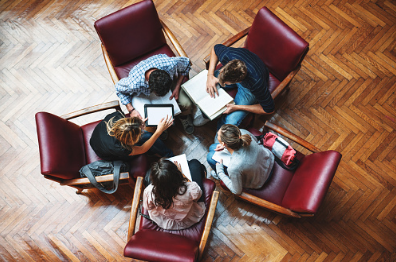 The number of copy-right infringement notices given to colleges is a clear indication of how students are able to access and enjoy free content. Most of premium content is available at affordable costs, but it is so easy to get it free that no one even pays the actual amount. This has lead to a great loss to online TVs , tutorial teachers and movie sellers. The securities based on encrypted video streaming and authentication is an effective solution to this problem . These DRM technologies prevent download from any such downloader on web. This restricts online and offline sharing of content. Another means to prevent video piracy is dynamic watermarking. Watermarking the videos with information of the subscribed user is an effective means to restrict uncontrolled distribution of videos. What are the costs of the solutions in terms of technology , usability and money ? There are no overhead costs of these technologies in terms of bandwidth or other network resources. The underlying innovation itself is the prized commodity. The quality of streaming can be easily maintained at par with any regular streaming. End users can access the content without installing any software on their desktops. Apps are available to ensure mobile compatibility along with security. With more and more companies coming up with innovative DRM systems customized for markets like media and e-learning , there is a hope that premium video content creators would be able to monetize to their potential. About the author – Siddhant is Co-founder at VdoCipher , Startup helping people to sell videos online. Check out the site if you are looking to prevent download of videos embedded on your site.